Apple's low-end desktop system is an excellent candidate for a solid-state drive upgrade. A SSD in a Mac mini replaces the slowest component and can really transform your Macintosh mini's computing experience. Historically, off the shelf Mac mini's have typicially had rather mediocre performing 4500 and later 5400RPM hard drives factory installed. Value - and not performance was more important to Apple. While the Apple Store online offers many Mac models with built-in or Build-To-Order SSD drive options, for a long time, it was not a configurable option on the base Mac mini. You could opt for a 7200RPM drive at a stiff price premium. Eventually, the OSX SERVER model offered a Mac mini SSD as a build-to-order option. Recently, Apple added it's Hard/SSD combo FUSION DRIVE option to finally deliver truly fast storage options on select, custom ordered models. As such, many Do It Yourselfer's opt to do thier own solid-state drive upgrade for Mac mini. More recent slimline models of the mini in 2010 and beyond are far more serviceable and easy to dissassemble than the original White, boxy ones. 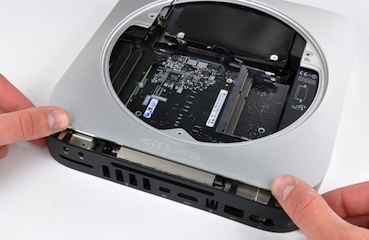 But with help from online How-To's and Mac take-apart videos anyone with the right tools, information and a steady hand can open their Mac mini, swap out their old drive and experience a huge leap in disk performance. With Torx T6 and T8 drivers, the new mini's were a breeze to dissassemble compared to the previous designs. It's critical to know that the SATA SSD can be either a 9mm or 7mm thick drive to fit in in the minimal space allowed in the new slimline enclosure. With the introduction of the Late 2014 Mac mini, Apple unfortunately has continued the overall trend of using new, different and unusually-shaped screwheads requiring specialized screw drivers to properly disassemble the newest Mac mini. A specialized 'U' shaped metal wire logic board pry-out tool and a special, new "Security" driver will be needed for a hard drive to 7mm SSD swap. In addition to the standard 7mm 2.5" SATA III internal hard drive on the underside of the motherboard - the 2014 mini also seems to have an empty push-on PCIe connector on the logic board for an SSD blade that's likely only used in BTO - Build To Order Configs. Also of note: The trend towards PCIe blades /modules instead of conventional SATA drives continues. On the top-end Mac mini server model eitheer a hybrid Apple FUSION drive or a 256GB, 512GB or even 1TB SSD is available as a factory installed configuration. This model is so new, it'll be ahile before all the details of the exact flash storage hardware used in higher-end configurations. When the original White mini was introduced - and for several years - it used a Parallel ATA / IDE 2.5" drive. 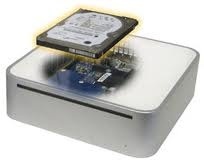 Mac mini compatible Solid-State PATA drives are available from a few manufacturers. A good set of Mac tools and the good ol' putty-kife are needed for all early generations of White Mac mini. The tricky latches around the entire perimeter of the mini's bottom case has frustrated many. Prying the putty-knife with care - you think the cover is NEVER going to come off as you work around the edge releasing latches - and then suddenly the cover comes off ridiculously easy! You just have to approach it with determination and confidence. There's more work to get down to the internal PATA - IDE hard drive itself. Buried under the CD/DVD drive, and with AirPort antenna's and wires to deal with, you just have to go slow and easy with pry-tools and the right screwdrivers to get to the original 11mm hard drive. Follow online instructions and video tutorials for take-apart, and swapping in the 11mm, 9mm, or 7mm solid-state flash memory drive is easy. Note - Apple, the Apple logo, iPod, iPhone, iPad, Mac Mac mini, iMac or MacBook, OSX and and any others are a registered trademark of Apple Computer Inc. in the U.S. or other countries and regions. Any other computing peripheral, accessory, upgrade, add-on and gizmo and gadget manufacturers, products and brand names that may be referred to on this web site are registered trademarks of each related business corporation. Apple's compact Intel Mac Mini desktop computer is a great candidate for an SSD. Most are reasonably easy Do-It-Yourself solid-state drive upgrades. 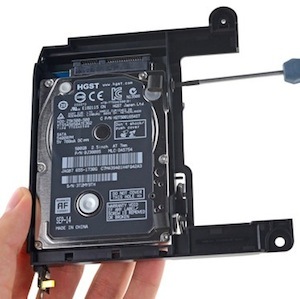 In 2014 7mm SATA drives are appropriate, 9mm for low-profile Mac mini's prior to late 2014, and up to 11mm for more boxy G4 and Intel mini's that had a built-in CD/DVD SuperDrive. 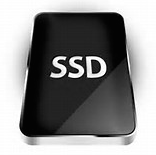 A multitude of 2.5" SATA Interface laptop size SSD flash drives dominate the retail market. The latest crop of SSD drives now have a 6GBps SATA III interface, but they're fully backward compatible with the SATA I and II chipsets Apple has been using for many years. For basic White MacBooks prior to Late 2008 / Early 2009 models - A midrange SSD is well matched to the older SATA I chipset 150Mbps tansfer rates.